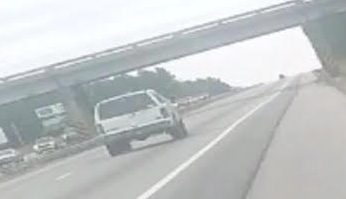 CALHOUN COUNTY, S.C. (WOLO) – Troopers with the South Carolina Department of Highway Patrol are asking for the public’s help identifying the driver of an SUV involved in a pedestrian hit-and-run resulting in great bodily injuries. According to officials, the vehicle pictured above is the actual vehicle in the crime and troopers describe it as a 2000-2006 White GMC Yukon or Chevrolet Tahoe. Troopers say the incident occured on Interstate 26EB at the 131 mile marker near Big Creek Road in Calhoun County. The vehicle would have minor damage to the passenger front. If you have any information that could help call the South Carolina Highway Patrol at 843-953-6010 or 800-768-1506.